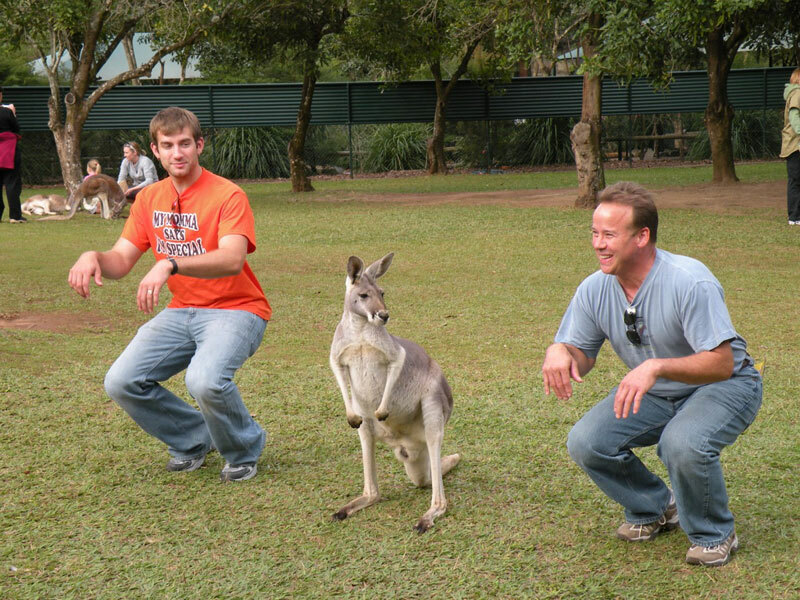 SYDNEY, AUSTRALIA—From petting kangaroos to tobogganing down a hillside, youth and young adult pilgrims from the archdiocese who traveled to Australia for World Youth Day spent the week prior to formal festivities exploring sights around the country. Now, the 91 pilgrims from central and southern Indiana are looking forward to a July 20 Mass that will be celebrated by Pope Benedict XVI. “Australians are a very kind group of people—their hospitality is like no other,” said Amanda Brinkman, 17, a member of St. Mary Parish in Mitchell in the Bloomington Deanery. One such example was at a local parish in Brisbane, where the parishioners of St. Patrick Parish threw a reception for the Indianapolis group following Mass celebrated in their church. St. Patrick parishioner Anne McNulty, who helped coordinate the pilgrims’ visit in the parish, said a lot of preparation went into organizing events to host the international guests, but it was worth it. “It’s been a pleasure and a privilege,” McNulty said. For four days after their arrival, the group had arranged tours at a variety of local sights in and around the Brisbane area, several hours north of Sydney. 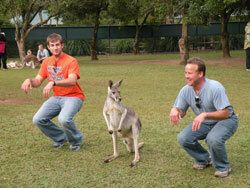 At the zoo, the pilgrims petted kangaroos and koala bears, fed elephants and attended a show about crocodiles. Later in the trip, the group spent time walking around Hinterland and Springbrook Park along the Gold Coast to see some of Australia’s natural beauty. They also stopped at the “Big Banana” where each person took a turn tobogganing down the hillside. Starting earlier this week, the pilgrims’ attention turned to the events of World Youth Day, which runs from July 15-20 in Sydney. The pilgrims have been participating in daily catechetical presentations, Mass and evening events, such as concerts and the sacrament of reconciliation and eucharistic adoration. “The excitement is starting to build, and that’s really exciting,” said Matt Trossman, a young adult father of three from Holy Family Parish in Oldenburg. Trossman, who comes to World Youth Day after a year of ups and downs, sees the pilgrimage as a time to re-energize. His health problems—combined with those of his father-in-law and grandmother as well as his wife’s car accident—left him needing a boost. At the urging of his wife, he decided to be a part of the pilgrimage to Australia.